A parade of performing pigs comes to town to put on a show. First they enjoy an enormous feast put on by the townspeople. After the big pig-out, the pigs sing and dance and the fun really begins! Here’s Wilbur, posing for the camera. Isn’t he handsome? A neighbor of mine had a pet pig named Wilbur (named for the pig in Charlotte’s Web). 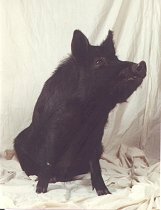 I always wanted to write a book in honor of Wilbur and all pigs, who are actually quite smart— Wilbur could sit and shake hands on command— and now I have! The pigs are coming to play, hooray! The pigs are coming today. A minute’s too long to delay. They’re coming by hot air balloon. 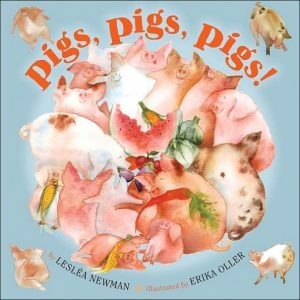 You are here: LesleaKids.com > Books for Kids & Teens > Picture Books > Pigs, Pigs, Pigs!